The below artworks are the most important by Marina Abramović - that both overview the major creative periods, and highlight the greatest achievements by the artist. Artwork description & Analysis: Abramović's first forays into performance focused primarily on sound installations, but she increasingly incorporated her body - often harming it in the process. In Rhythm 10, she used a series of 20 knives to quickly stab at the spaces between her outstretched fingers. Every time she pierced her skin, she selected another knife from those carefully laid out in front of her. Halfway through, she began playing a recording of the first half of the hour-long performance, using the rhythmic beat of the knives striking the floor, and her hand, to repeat the same movements, cutting herself at the same time. She has said that this work marked the first time she understood that drawing on the audience's energy drove her performance; this became an important concept informing much of her later work. Artwork description & Analysis: Viewing both life and performance art as reaching beyond the realm of awareness, Abramović has created performances in which she sleeps or becomes drugged into unconsciousness to examine this crucial aspect of life. In Rhythm 5, she created a star shape with wood shavings covered in gasoline and lit the wood on fire. After cutting her nails and hair and dropping them into the fire, she lay down within the burning star, a symbol both of the occult and of Communism in Yugoslavia. When audience members realized her clothes were on fire and she had lost consciousness due to the lack of oxygen amidst the flames, they pulled her out, ending the performance. After performing Rhythm 5, she said she "realized the subject of my work should be the limits of the body. I would use performance to push my mental and physical limits beyond consciousness." Artwork description & Analysis: With a description reading "I am the object," and, "During this period I take full responsibility," Abramović invited spectators to use any of 72 objects on her body in any way they desired, completely giving up control. Rhythm 0 was exemplary of Abramović's belief that confronting physical pain and exhaustion was important in making a person completely present and aware of his or her self. This work also reflected her interest in performance art as a way to transform both the performer and the audience. She wanted spectators to become collaborators, rather than passive observers. Here, they physically directed the actions, while in other performances, Abramović involved the audience through a dynamic exchange of energy. In Rhythm 0, the audience divided itself into those who sought to harm Abramović (holding the loaded gun to her head) and those who tried to protect her (wiping away her tears). Ultimately, after she stood motionless for six hours, the protective audience members insisted the performance be stopped, seeing that others were becoming increasingly violent. Artwork description & Analysis: Rest Energy was only four minutes and 10 seconds long, but it was a highly intense piece that revealed the fragility of the line between life and death. Abramović and Ulay faced each other, aiming an arrow on a tense bow, just inches from her heart. They placed small microphones on their chests to make audible their increasingly rapid heartbeats in response to the growing danger. This work was one of their many performances that depended on a close relationship and trust. Many of their works also often involved elements of extreme duration, a characteristic that Abramović continued after she and Ulay stopped working together. Artwork description & Analysis: Reminiscent of Cleaning the Mirror #1 (1995), in which she sat on a stool for three hours washing a skeleton, Abramović created Balkan Baroque in response to the innumerable deaths that had taken place in the former Yugoslavia. Sitting on top of 1,500 cow bones in a white dress, she spent four days, six hours a day, washing each of these bloody bones, surrounded by projected images of her parents and herself. The accompanying sound included her recorded description of methods used in the Balkans for killing rats and her singing of her native folksongs. The performance progression was made visceral due to the unbearable heat of the basement room and fetid smell. For Abramović, it was not enough to simply recount the number of people lost in modern-day war. Instead, she aimed to remember the lives, efforts and hopes of individuals killed by carefully touching and cleaning "their" physical bones and blood. 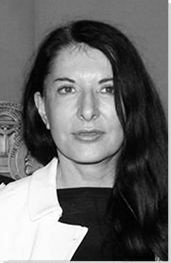 Transforming her individual performative experiences into universal ideas was also an important concept for Abramović throughout all her work. The comparison between the inability to scrub away all the blood and the inability to erase the shame of war is a concept she viewed as having universal reach. Artwork description & Analysis: In The House with the Ocean View, Abramović spent twelve days in the Sean Kelly Gallery without eating, writing or speaking. Contained within three 'rooms' built six feet off the ground, Abramović slept, drank water, urinated, showered and gazed at the viewers wearing a differently colored outfit each day. She could walk between the three rooms, but the ladders leading to the floor had rungs made of butcher knives. Set to the sound of a metronome, Abramović ritualized the activities of daily life, focusing on the self and simplicity while eliminating all aspects of narrative and dialogue. She saw this piece as an act of purification - not just for herself, but also for any viewer who entered the space. This piece was a shift from the masochism of her earlier works to performances that focus more on ideas of presence and shared energy, although there is still the element of danger present in the butcher knife ladder. In addition, it was an extension of the challenging durational works that have long been a significant aspect of Abramović's career.